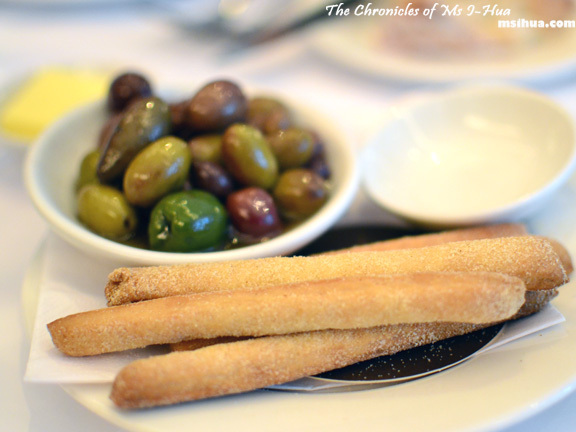 I have had Bottega on my list of “must-dine” restaurants for ages now. I’ve had countless people suggest to me that if I want a good Italian meal, I must head down to Bottega’s. So why haven’t I been there before? The only excuse I have is that it’s located on the other side of the Melbourne CBD from me, and as such I do not have the luxury of walking or tramming it to the restaurant and back under my one hour scheduled lunch. So when I was recently notified that Bottega would be launching a new 2 course Express Lunch menu in time with their 10th anniversary, my interest was piqued. The menu, designed by Head Chef Gabriele Olivieri with wines matched by Cellar Master (I love that title! 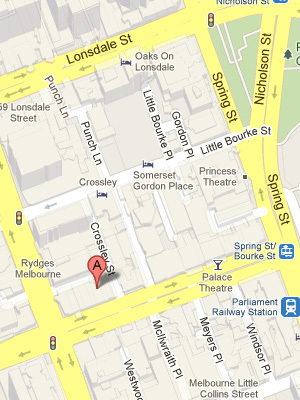 ), Ben Knight, caters to the busy Melbourne CBD working folks. Obviously, if you are visiting or have time to relax and enjoy, you can choose either the Express Lunch or normal lunch menu which can be enjoyed without rushing (with the risk of heartburn). Speaking to the owner Denis Lucey, he mentions that although Bottega has been around for the last decade, they are by no means resting on their laurels and are constantly open for new ideas, suggestions and trials, whilst keeping true to their Modern Italian cuisine. Which is great as “Bottega” in Italian means an art or craft workshop, indicating that new concepts and ideas are constantly on the table. For the purposes of our meeting however, Denis and Gabriele showcased a range of dishes from both the lunch and dinner menus, highlighting the house specials and favourites of their regular punters. We had a couple of entrees to get us started from their menu. 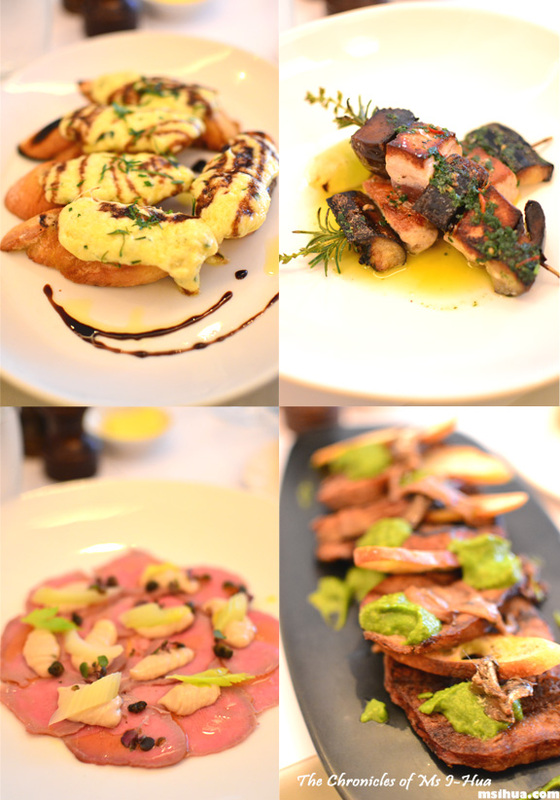 [Clockwise from top right] Rosemary Spiedino of Yellow Fin Tuna & Eggplant, Anchovy, Parsley and Chilli Oil (Dinner menu); Char-grilled Ox Tongue, Salsa Verde, Anchovy & Croutons (Lunch menu); Vitello Tonnato, Pickled Celery Hearts, Crispy Capers (Dinner menu); and Bruschetta, Baccala Matecato and Vincotto (Lunch menu). Out of all the above, I enjoyed the yellow fin tuna and eggplant the most. I also accidentally ate a piece of the vitello tonnato (veal) carpaccio whilst engrossed in a conversation with Denis. The problem was that I still hadn’t realised that I had eaten a piece of veal (remember that I do not consume beef) until Denis mentioned it was veal. Luckily it was only a piece (and quite tasty too, I might add *oops*). But my favourite of the starters would almost certainly be the delicate Buffalo Ricotta Filled Zucchini Flowers, Tomato and Basil Coulis, Vincotto (Dinner menu). It was light, and it was soft and lush, almost bashful in its performance. 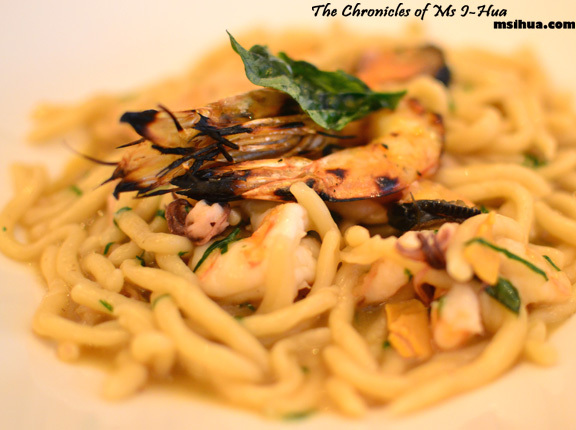 Yet, it had nothing to be shy about as the flavours were rich and bold. We had two pasta dishes to try. The first was the Roasted Tomato and Burrata Agnolotti, Smoked Eggplant Purée, Lemony Rocket Salade, and Balsamico (Lunch and Dinner menu), which was surprisingly less rich than it sounded. I was waiting for the roasted tomato flavours to come through, but it was somehow shadowed by the rich eggplant (baba ghanoush style) leaving me just a little wanting. In this day and age, it’s nice to know that when one orders a pasta dish from an Italian restaurant, the pasta comes out freshly made and is not pre-bought elsewhere. All pasta is made in-house, except for the fettuccine, and if Head Chef Gabriele gets his way, it may eventually be made in his kitchen as well. The second pasta we had was a strozzapreti, which loosely translates to “Strangled Priest” or “Priest Choker”. Legend has it that some priests were so greedy in consuming these delicious morsels that they choked to death. 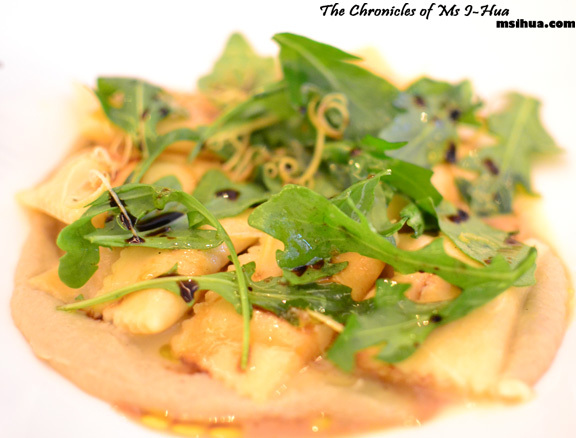 Luckily for us, none of that happened when we dined on this dish. Another version of the strozzapreti pasta is available on the Express Lunch menu (with pork and beef ragu instead). I really really loved the freshness of the pasta, and cannot wait to come back for a proper extended lunch or dinner soon with the Boy. For the last of our mains, we finished off with a bang. You know me. As long as there is pork belly, I am a happy lady! 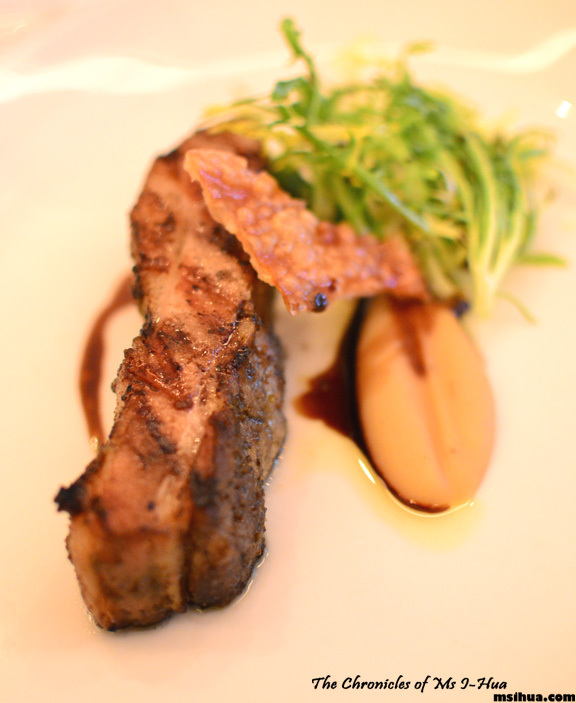 The Char-grilled Western Plains Pork Belly, Peppered Apple Puree, Frisée Salad and Crackling (Dinner menu) tied the lunch up very nicely. 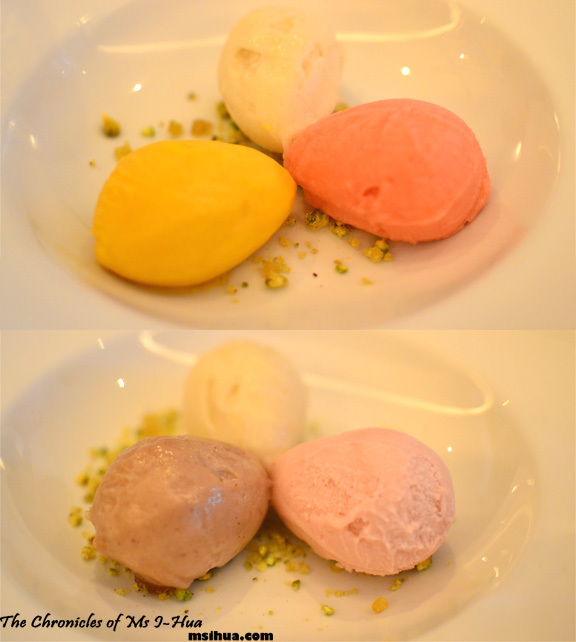 For desserts, we had a selection of house-made sorbetti (sorbets) which included Mango, Pear, Blood Orange, Vanilla & Chestnut and Peach. Hands down winner for me was the mango, pear, blood orange, vanilla & chestnut and peach. Heck, that’s all of them! I really enjoyed the selection we managed to sample that day, and can’t wait to go back for a proper meal. I think the Express Lunch deal (prices below) are pretty good, given that it’s equivalent to what I paid for express lunch menu options during the Melbourne Food and Wine Festival. So tell me dear friends, where have you always wanted to go, but have put up the excuse that it’s too far away or that it’d take too long? hmm, i didn’t know this place exists! What?! How can you miss it?! Yum, the food looks fantastic. I’ve been meaning to come here for awhile now. The photos are mouth-watering! Yummy, the pasta looks so delicious, I can’t help but salivate. LOL. Thanks for sharing! Heidi – Apples Under My Bed recently posted…Weekend Inspiration. Bahaha, I love that we’ve got unagi in there now too!! Nah can’t be worst 🙂 I’m right near the Immigration museum… so pretty far as well! Oh WOW what an amazing restaurant. 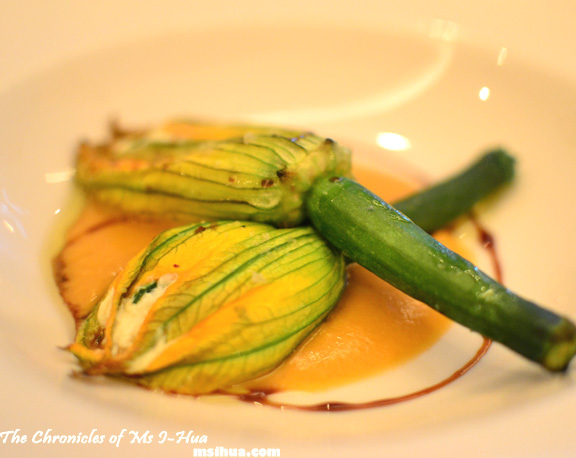 I only had zucchini flowers once but it was filled with goats cheese. Now, thinking about it I think ricotta like yours would’ve made a better stuffing? Or at least one I’d enjoy more. Hey I wanna save up to eat at this meal. So many highlights! Its an amazing restaurant which is a nice place of getting Italian meals. I want to have Italian recipes at Bottega. Devin Payton recently posted…Gold: What’s REALLY Behind the Record Rise, Bull or Bubble? [email protected] recently posted…What’s your cup of tea? The list just keeps getting longer!